South Africa’s embattled cement producers will continue to focus on improving operational efficiencies to ensure their survival in an extremely cautious economy that has brought many large state-driven civil-engineering infrastructure and private-sector property developments to a grinding halt. This strategy will also entail only partnering reputable road-freight logistics companies that have an intricate understanding of the nature of their operating environment to assist them in developing more efficient and cost-effective ways of delivering cement to where it is needed. 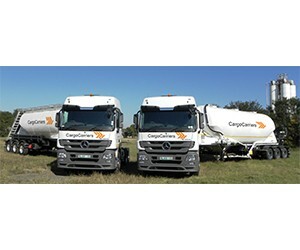 Cargo Carriers, the Johannesburg Stock Exchange-listed supply-chain specialist, has nurtured a close working relationship with most of the country’s cement producers over many years, and this has allowed the company to commit the necessary capital to support ongoing innovation in the transportation of cement. A sound case in point is the deployment of cutting-edge technologies, such as on-board systems, to significantly improve supply-chain visibility for these customers. They are serviced by the Powders operations which consistently achieved a more than a 98% scoring for on-time deliveries in 2017 on the back of improved operational efficiencies, driver safety and customer turnaround times. This is evidenced by the many civil-engineering and building contractors that have gone into liquidation, and the excessive over-supply of cement in South Africa. In 2017, the price of cement declined to levels last seen in 2009, when the bulk of many of the civil- and structural components of large infrastructure and development projects were nearing completion in time to host the FIFA Soccer World Cup the following year. This is a far cry from the construction boom period between 2002 and 2007 when cement demand outstripped available production capacities and South African producers achieved EBITDA margins of between 30% and 40%. It was during this period that local cement producers also substantially bolstered available production capacities to supply a burgeoning demand for the construction material. At least two domestic producers embarked on large capital-expenditure expansion programmes, while another took a more cautious approach by focusing on improving efficiencies at its existing operations to supply the high demand for this construction material. Meanwhile, their international counterparts also started taking a serious look at South Africa as a prime investment destination as the country’s government prioritised alleviating the growing backlog in transport, energy, water and social infrastructure. Two new international participants would later enter the country to start producing cement to also supply those much-anticipated mega projects enshrined in the National Development Plan. However, lack-lustre growth that persisted long after the international economic collapse at the end of 2008 brought many of these so-called “Strategic Infrastructure Projects” to a standstill. This was compounded by political uncertainty and, consequently, dwindling investor confidence, which also had a profound negative impact on private-sector property development projects in the country. In 2017, installed cement production capacity in South Africa stood at 20-million tons versus a local demand of about 13-million tons. This dire situation has been aggravated by the flooding of the South African market, especially the coastal areas, with cheap cement from Asian countries. These increased by 29% year-on-year in 2017 to more than 500 000 tons in 2017, as opposed to almost 400 000 tons in 2016. The entire industry is expected to remain under pressure this year, considering the contraction of the economy by as much as 2,2% in the first quarter. At the same time, the construction industry experienced its fifth consecutive quarter of decline, losing R1,7 billion in value since the last quarter of 2016, although some reprieve is expected due to government’s focus on social infrastructure, including housing, clinics and schools in the build-up towards the national elections. Similar to many other industrial and manufacturing segments of the market, cement producers are also grappling with rising input costs. Established companies with older clinkering and grinding stations are more exposed to increasing electricity prices compared to their younger competitors with new and more efficient plants in this energy-intensive industry. This is being exacerbated by the diesel fuel hikes, which directly impacts cement transportation operations. Road transportation has always been a substantial contributor towards the delivered price of cement, and it is unlikely that these increases will be able to be passed on to the consumer in an-already heavily saturated market. Cargo Carriers has a long and impressive track record using fuel efficiently to lower operating costs. The company continues to advance information technology to constantly monitor the efficient use of diesel, complemented by ongoing driver training and a robust fleet maintenance and replacement regime that place fuel efficiency on top of the agenda. However, Cargo Carriers has truly demonstrated its long-term commitment to this industry through its willingness to invest in necessary logistics infrastructure as a strategic partner to many of its cement-producing customers. This has ensured that all of the Powder operations are located within close proximity to production and distribution facilities to greatly assist in alleviating distribution pressures. Noticeably, all of these operations also scored more than 90% in their internal ISO audits, while the Free State and Eastern Cape businesses achieved more than 95% in 2017’s customer audits. This focus on excellence also played a large part in the Free State and Eastern Cape Powder operations successfully securing contracts to transport bulk and bagged cement products for customers in those territories last year. However, a major highlight for Cargo Carrier’s Powders operation was the awarding of a five-year contract to Heavy Hauliers Zambia to deliver bulk cement for the construction of the new Kafue Gorge Lower Power Station. It was also awarded this contract based on the group’s ability to provide high service levels, best value logistics solutions and, importantly, its unwavering commitment to SHEQ. Importantly, this project provides the group the opportunity to build a solid footprint in the country, which is known for its vibrant copper-mining industry that is a major driver of economic growth there. Clearly, Cargo Carriers has laid strong foundations in the South African cement-production industry and will continue to build on these moving forward. This will ensure that its customers are in a prime position to take advantage of the upturn in construction when it arrives.